This article is about the history of North Macedonia. For the history of the wider Macedonian region, see History of Macedonia (region). Ancient tribes in the region. In antiquity, most of the territory that is now North Macedonia was included in the kingdom of Paeonia, which was populated by the Paeonians, a people of Thracian origins, but also parts of ancient Illyria and Dardania, inhabited by various Illyrian peoples, and Lyncestis and Pelagonia populated by the ancient Greek Molossian tribes. None of these had fixed boundaries; they were sometimes subject to the Kings of Macedon, and sometimes broke away. In the late 6th century BC, the Achaemenid Persians under Darius the Great conquered the Paeonians, incorporating what is today the Republic of North Macedonia within their vast territories. Following the loss in the Second Persian invasion of Greece in 479 BC, the Persians eventually withdrew from their European territories, including thus from what is today the Republic of North Macedonia. In 336 BC Philip II of Macedon fully annexed Upper Macedonia, including its northern part and southern Paeonia, which both now lie within the Republic of North Macedonia. Philip's son Alexander the Great conquered most of the remainder of the region, incorporating it in his empire, with exclusion of Dardania. The Romans included most of the Republic in their province of Macedonia, but the northernmost parts (Dardania) lay in Moesia; by the time of Diocletian, they had been subdivided, and the Republic was split between Macedonia Salutaris and Moesia prima. Little is known about the Slavs before the 5th century. At this period the area divided from the Jireček Line was populated from people of Thraco-Roman or Illyro-Roman origins, as well from Hellenized citizens of the Byzantine Empire and Byzantine Greeks. The ancient languages of the local Thraco-Illyrian people had already gone extinct before the arrival of the Slavs, and their cultural influence was highly reduced due to the repeated barbaric invasions on the Balkans during the early Middle Ages, accompanied by persistent hellenization, romanisation and later slavicisation. South Slavic tribes settled in the territory of the present-day Republic of North Macedonia in the 6th century. The Slavic settlements were referred to by Byzantine Greek historians as "Sklavines". The Sklavines participated in several assaults against the Byzantine Empire - alone or aided by Bulgars or Avars. Around 680 AD the Bulgar group, led by khan Kuber (who belonged to the same clan as the Danubian Bulgarian khan Asparukh), settled in the Pelagonian plain, and launched campaigns to the region of Thessaloniki. In the late 7th century Justinian II organized massive expeditions against the Sklaviniai of the Greek peninsula, in which he reportedly captured over 110,000 Slavs and transferred them to Cappadocia. By the time of Constans II (who also organized campaigns against the Slavs), the significant number of the Slavs of Macedonia were captured and transferred to central Asia Minor where they were forced to recognize the authority of the Byzantine emperor and serve in its ranks. Use of the name "Sklavines" as a nation on its own was discontinued in Byzantine records after circa 836 as those Slavs in the Macedonia region became a population in the First Bulgarian Empire. Originally two distinct peoples, Sklavines and Bulgars, the Bulgars assimilated the Slavic language/identity whilst maintaining the Bulgarian demonym and name of the empire. Slavic influence in the region strengthened along with the rise of this state, which incorporated the entire region to its domain in AD 837. Saints Cyril and Methodius, Byzantine Greeks born in Thessaloniki, were the creators of the first Slavic Glagolitic alphabet and Old Church Slavonic language. They were also apostles-Christianizators of the Slavic world. Their cultural heritage was acquired and developed in medieval Bulgaria, where after 885 the region of Ohrid became a significant ecclesiastical center with the nomination of the Saint Clement of Ohrid for "first archbishop in Bulgarian language" with residence in this region. In conjunction with another disciple of Saints Cyril and Methodius, Saint Naum, he created a flourishing Bulgarian cultural center around Ohrid, where over 3,000 pupils were taught in the Glagolitic and Cyrillic script in what is now called Ohrid Literary School. At the end of the 10th century, much of what is now North Macedonia became the political and cultural center of the First Bulgarian Empire under Tsar Samuil; while the Byzantine emperor Basil II came to rule the eastern part of the empire (what is now Bulgaria), including the then capital Preslav, in 972. A new capital was established at Ohrid, which also became the seat of the Bulgarian Patriarchate. From then on, the Bulgarian model became an integral part of wider Slavic culture as a whole. After several decades of almost incessant fighting, Bulgaria came under Byzantine rule in 1018. The whole of North Macedonia was incorporated into the Byzantine Empire as Theme of Bulgaria  and the Bulgarian Patriarchate was reduced in rank to an archbishopric. Dobromir Chrysos rebelled against the emperor and after an unsuccessful imperial campaign in autumn 1197, the emperor sued for peace and recognized Dobromir-Chrysus’ rights to lands between the Strymon and Vardar, including Strumica and the fortress of Prosek. In the 13th and 14th centuries, Byzantine control was punctuated by periods of Bulgarian and Serbian rule. For example, Konstantin Asen - a former nobleman from Skopje - ruled as tsar of Bulgaria from 1257 to 1277. Later, Skopje became a capital of the Serbian Empire under Stefan Dušan. After the dissolution of the empire, the area became a domain of independent local Serbian rulers from the Mrnjavčević and Dragaš houses. The domain of the Mrnjavčević house included western parts of the present-day North Macedonia and domains of the Dragaš house included eastern parts. The capital of the state of Mrnjavčević house was Prilep. There are only two known rulers from the Mrnjavčević house - king Vukašin Mrnjavčević and his son, king Marko. King Marko became a vassal of the Ottoman Empire and later died in the Battle of Rovine. Conquered by the Ottoman army in the first half of the 15th century, the region remained a part of the Ottoman Empire for nearly 500 years, as part of the province or Eyalet of Rumelia. The name Rumelia (Turkish: Rumeli) means "Land of the Romans" in Turkish, referring to the lands conquered by the Ottoman Turks from the Byzantine Empire. ). Over the centuries Rumelia Eyalet was reduced in size through administrative reforms, until by the nineteenth century it consisted of a region of central Albania and north-western part of the current state of North Macedonia with its capital at Manastir or present day Bitola. Rumelia Eyalet was abolished in 1867 and the territory of North Macedonia subsequently became part of the province of Manastir Vilayet until the end of Ottoman rule in 1912. During the period of Ottoman rule the region gained a substantial Turkish minority, especially in the religious sense of Muslim; some of those Muslims became so through conversions. During the Ottoman rule, Skopje and Monastir (Bitola) were capitals of separate Ottoman provinces (eyalets). The valley of the river Vardar, which was later to become the central area of the Republic of North Macedonia, was ruled by the Ottoman Empire prior to the First Balkan War of 1912, with the exception of the brief period in 1878 when it was liberated from Ottoman rule after the Russo-Turkish War (1877–78), becoming part of Bulgaria. In 1903, a short-lived Kruševo Republic was proclaimed in the south-western part of present-day Republic of North Macedonia by the rebels of the Ilinden–Preobrazhenie Uprising. Most of the ethnographers and travellers during Ottoman rule classified Slavic speaking people in Macedonia as Bulgarians. Examples include the 17th century traveller Evliya Çelebi in his Seyahatname: Book of Travels to the Ottoman census of Hilmi Pasha in 1904 and later. However, they also remarked that the language spoken in Macedonia had somewhat of a distinctive character — often described as a "Western Bulgarian dialect" as other Bulgarian dialects in modern western Bulgaria. Evidence also exists that certain Macedonian Slavs, particularly those in the northern regions, considered themselves as Serbs, on the other hand the intention to join Greece predominated in southern Macedonia where it was supported by substantial part of the Slavic-speaking population too. Although references are made referring to Slavs in Macedonia being identified as Bulgarians, some scholars suggest that ethnicity in medieval times was more fluid than what we see it to be today, an understanding derived from nineteenth century nationalistic ideals of a homogeneous nation-state. During the period of Bulgarian National Revival, many Bulgarians from Vardar Macedonia supported the struggle for creation of Bulgarian cultural educational and religious institutions, including Bulgarian Exarchate. The region was captured by the Kingdom of Serbia during First Balkan War of 1912 and was subsequently annexed to Serbia in the post-war peace treaties. It had no administrative autonomy and was called Južna Srbija ("Southern Serbia") or Stara Srbija ("Old Serbia"). It was occupied by Kingdom of Bulgaria between 1915 and 1918. After the First World War, the Kingdom of Serbia joined the newly formed Kingdom of Serbs, Croats and Slovenes. In 1929, the kingdom was officially renamed the Kingdom of Yugoslavia and was divided into provinces called banovinas. The territory of Vardar Banovina had Skopje as its capital and it included what eventually became the modern Republic of North Macedonia. After World War I (1914–1918) the Slavs in Serbian (Vardar) Macedonia were regarded as southern Serbs and the language they spoke a southern Serbian dialect. The Bulgarian, Greek and Romanian schools were closed, the Bulgarian priests and all non-Serbian teachers were expelled. The policy of Serbianization in the 1920s and 1930s clashed with pro-Bulgarian sentiment stirred by Internal Macedonian Revolutionary Organization (IMRO) detachments infiltrating from Bulgaria, whereas local communists favoured the path of self-determination. In 1925, D. J. Footman, the British vice consul at Skopje, addressed a lengthy report for the Foreign Office. He wrote that "the majority of the inhabitants of Southern Serbia are Orthodox Christian Macedonians, ethnologically more akin to the Bulgarians than to the Serbs. He also pointed to the existence of the tendency to seek an independent Macedonia with Salonica as its capital." During World War II, the Vardar Banovina was occupied between 1941 and 1944 by Italian-ruled Albania, which annexed the Albanian-populated western regions, and pro-German Bulgaria, which occupied the remainder. The occupying powers persecuted those inhabitants of the province who opposed the regime; this prompted some of them to join the Communist resistance movement of Josip Broz Tito. However, the Bulgarian army was well received by most of the population when it entered Macedonia and it was able to recruit from the local population, which formed as much as 40% to 60% of the soldiers in certain battalions. Following World War II, Yugoslavia was reconstituted as a federal state under the leadership of Tito's Yugoslav Communist Party. When the former Vardar province was established in 1944, most of its territory was transferred into a separate republic while the northernmost parts of the province remained with Serbia. In 1946, the new republic was granted federal status as an autonomous "People's Republic of Macedonia" within the new Socialist Federal Republic of Yugoslavia. In the 1963 Constitution of Yugoslavia it was slightly renamed, to bring it in line with the other Yugoslav republics, as the Socialist Republic of Macedonia. The Socialist Republic of Macedonia highlighted in red within the Socialist Federal Republic of Yugoslavia. Greece was concerned by the initiatives of the Yugoslav government, as they were seen as a pretext for future territorial claims against the Greek province of "Northern Greece" which formed the bulk of historical Macedonia and was also officially called 'Macedonia'. The Yugoslav authorities also promoted the development of the Macedonians' ethnic identity and Macedonian language. The Macedonian language was codified in 1944 (Keith 2003), from the Slavic dialect spoken around Veles. This further angered both Greece and Bulgaria, because of the possible territorial claims of the new states to the Greek and Bulgarian parts of the region of Macedonia received after the Balkan Wars. During the Greek Civil War (1944–1949), many Macedonians (regardless of ethnicity) participated in the ELAS resistance movement organized by the Greek Communist Party. ELAS and Yugoslavia were on good terms until 1949, when they split due to Tito's lack of allegiance to Joseph Stalin (cf. Cominform). After the end of the war, the ELAS fighters who took refuge in southern Yugoslavia and Bulgaria were not all permitted by Greece to return: only those who considered themselves Greeks were allowed, whereas those who considered themselves Bulgarians or Macedonians were barred. These events also contributed to the bad state of Yugoslav-Greek relations in Macedonia. In 1990, the form of government peacefully changed from socialist state to parliamentary democracy. The first multi-party elections were held on 11 and 25 November and 9 December 1990. After the collective presidency led by Vladimir Mitkov was dissolved, Kiro Gligorov became the first democratically elected president of the Republic of Macedonia on 31 January 1991. On 16 April 1991, the parliament adopted a constitutional amendment removing "Socialist" from the official name of the country, and on 7 June of the same year, the new name, Republic of Macedonia, was officially established. On 8 September 1991, the Republic of Macedonia held a referendum where 95.26% voted for independence from Yugoslavia, under the name of the Republic of Macedonia. The question of the referendum was formulated as "Would you support independent Macedonia with the right to enter future union of sovereign states of Yugoslavia?" (Macedonian: Дали сте за самостојна Македонија со право да стапи во иден сојуз на суверени држави на Југославија?). On 25 September 1991 the Declaration of Independence was formally adopted by the Macedonian Parliament making the Republic of Macedonia an independent country - although in Macedonia independence day is still celebrated as the day of the referendum 8 September. A new Constitution of the Republic of Macedonia was adopted on 17 November 1991. Bulgaria was the first country to recognize the new state under its constitutional name. However, international recognition of the new country was delayed by Greece's objection to the use of what it considered a Hellenic name and national symbols, as well as controversial clauses in the Republic's constitution. To compromise, Macedonia was admitted to the United Nations under the provisional name of "the former Yugoslav Republic of Macedonia" on 8 April 1993. Greece was still dissatisfied and it imposed a trade blockade in February 1994. The sanctions were lifted in September 1995 after Macedonia changed its flag and aspects of its constitution that were perceived as granting it the right to intervene in the affairs of other countries. The two neighbours immediately went ahead with normalizing their relations, but the state's name remains a source of local and international controversy. The usage of each name remains controversial to supporters of the other. After the state was admitted to the United Nations under the temporary reference "the former Yugoslav Republic of Macedonia", other international organisations adopted the same convention. More than half of the UN's member states have recognized the country as the Republic of Macedonia, including the United States of America while the rest use the temporary reference "the former Yugoslav Republic of Macedonia" or have not established any diplomatic relations with Macedonia. In 1999, the Kosovo War led to 340,000 Albanian refugees from Kosovo fleeing into Macedonia, greatly disrupting normal life in the region and threatening to upset the balance between Macedonians and Albanians. Refugee camps were set up in Macedonia. Athens did not interfere with the Republic's affairs when NATO forces moved to and from the region ahead a possible invasion of Yugoslavia. Thessaloniki was the main depot for humanitarian aid to the region. The Republic did not become involved in the conflict. In end the war, Yugoslav president Slobodan Milošević reached agreement with NATO which allowed refugees to return under UN protection. However, the war increased tensions and relations between ethnic Macedonians and Albanian Macedonians became strained. On the positive side, Athens and Ankara presented a united front of 'non-involvement'. In Greece, there was a strong reaction against NATO and the United States. Monument in Makedonska Kamenica to a Macedonian soldier killed during the insurgency in 2001. In the spring of 2001, ethnic Albanian insurgents calling themselves the National Liberation Army (some of whom were former members of the Kosovo Liberation Army) took up arms in the west of the Republic of Macedonia. They demanded that the constitution be rewritten to enshrine certain ethnic Albanian interests such as language rights. The guerillas received support from Albanians in NATO-controlled Kosovo and ethnic Albanian guerrillas in the demilitarized zone between Kosovo and the rest of Serbia. The fighting was concentrated in and around Tetovo, the fifth largest city in the republic. After a joint NATO-Serb crackdown on Albanian guerrillas in Kosovo, European Union (EU) officials were able to negotiate a cease-fire in June. The government would give ethnic Albanians greater civil rights, and the guerrilla groups would voluntarily relinquish their weapons to NATO monitors. This agreement was a success, and in August 2001 3,500 NATO soldiers conducted "Operations Essential Harvest" to retrieve the arms. Directly after the operation finished in September the NLA officially dissolved itself. Ethnic relations have since improved significantly, although hardliners on both sides have been a continued cause for concern and some low level violence continues particularly directed against police. On 26 February 2004, President Boris Trajkovski died in a plane crash near Mostar, Bosnia and Herzegovina. The results of the official investigation revealed that the cause of the plane accident was procedural mistakes by the crew, committed during the approach to land at Mostar airport. In March 2004, the Republic of Macedonia submitted an application for membership of the EU. On 17 December 2005, EU Presidency conclusions listed the Republic of Macedonia as an accession candidate. It was expected that the EU would announce in late 2006 the date for commencement of EU accession negotiations. In August 2005, Poland became the 112th country, out of 191 total members of UN, to recognize the then Republic of Macedonia under its constitutional name. Before a permanent agreement between Greece and the Republic of Macedonia about the latter's name had been reached, the proposal was to name it 'Republika Makedonija-Skopje' (with that spelling), but was rejected by the Republic of Macedonia. The UN mediator Matthew Nimetz proposed another form several months afterward, proposing that the name "Republika Makedonija" should be used by the countries that have recognized the country under that name and that Greece should use the formula "Republika Makedonija – Skopje", while the international institutions and organizations should use the name "Republika Makedonia" in Latin alphabet transcription, but this form was rejected by Greece. In June 2018, an agreement was reached between the governments of Greece and the then Republic of Macedonia to rename the latter the Republic of North Macedonia, or North Macedonia for short. This agreement, after it had been accepted by the respective legislatures of both countries, came into effect on 12 February 2019, thus ending the disputes. ^ Wilkes, John: The Illyrians, Wiley-Blackwell, 1996, ISBN 0-631-19807-5, p. 49. 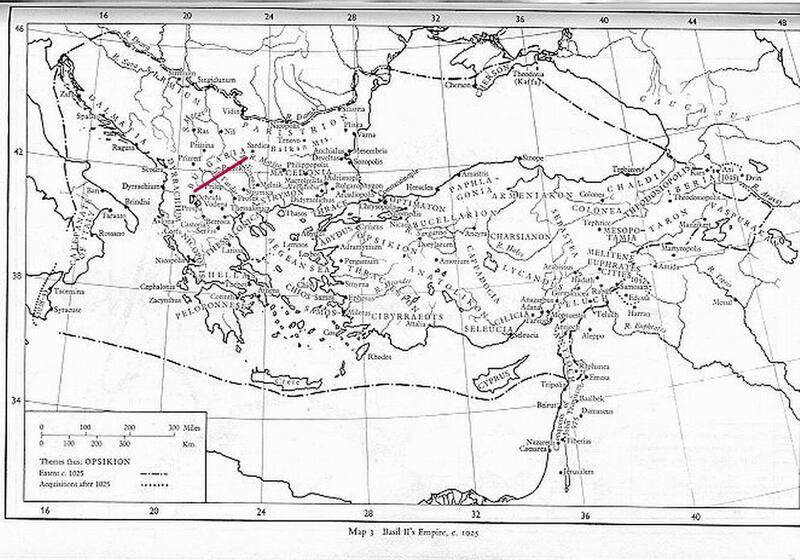 ^ Sealey, Raphael, A history of the Greek city states, ca. 700-338 B.C., p. 442]. University of California Press, 1976. ISBN 0-520-03177-6. ^ Borza, Eugene N., In the shadow of Olympus: the emergence of Macedon, Princeton University Press, 1992, ISBN 0-691-00880-9, pp. 74-75. ^ Lewis, D.M. et al. (ed. ), The Cambridge ancient history: The fourth century B.C., Cambridge University Press, 2000, ISBN 0-521-23348-8, pp. 723-724. ^ "A Companion to Ancient Macedonia". Retrieved 17 December 2014. ^ Poulton, Hugh, Who are the Macedonians? C. Hurst & Co. Publishers, 2000, ISBN 1-85065-534-0, p. 14. ^ Walter Pohl. (p. 13-24 in: Debating the Middle Ages: Issues and Readings, Ed. Lester K. Little and Barbara H. Rosenwein, Blackwell Publishers, 1998)Ethnic boundaries are not static, and even less so in a period of migrations. It is possible to change one's ethnicity... Even more frequently, in the Early Middle Ages, people lived under circumstances of ethnic ambiguity. Wikimedia Commons has media related to History of North Macedonia. The Holocaust in Bitola, 1941-1945: 3,000 Jews were deported from Bulgarian annexed Macedonia. The Mariovo in Macedonia, 1564: Mariovo People and Macedonia.